Doctor Who has won the prize for best drama at this year's National Television Awards in London. The BBC Wales-produced series won the award for the fifth time, beating The Bill, Casualty and Shameless. David Tennant also took the outstanding drama performance gong, a prize he has won each year he has played Doctor Who. Gavin and Stacey, made by Baby Cow Productions for the BBC and partly set in Barry in the Vale of Glamorgan, won most popular comedy programme. The show by James Corden and Ruth Jones has come to an end after three series. 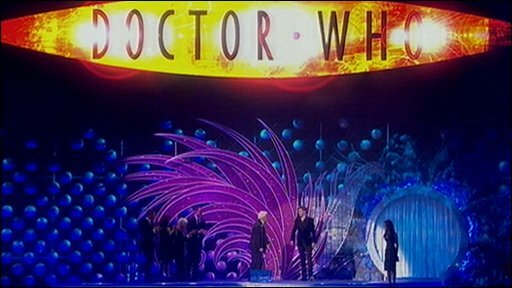 David Tennant, whose final outing as Doctor Who took place on New Year's Day, was among the audience at the O2 Arena. Fellow cast member Bernard Cribbins said, pointing at Tennant: "This is absolutely wonderful and I know how pleased he must be as he's been at it for four years. "I think everybody who gets involved will be just as pleased as him, and I know that he will want to pay tribute to the team down in Wales." Tennant is replaced as the Doctor by 27-year-old actor Matt Smith.